You Called Me A... Tiger Face? We've been called quite a few names in our lifetime (we have a few siblings), but never in our lives have we been called a tiger face. That term isn't offensive at all, on the contrary, it's creative, fun to say, and we love it. From this moment on, we will only answer to 'tiger face.' It's an honor to be compared to such a majestic beast and we embrace it wholeheartedly. We can't wait to get it changed legally. Now for the next minor fiasco, how do we transform our face to mimic the creature's glorious visage...? Oh, would you look at that; problem solved! While making an appointment for a permanent tattoo, this unique product fell into our laps, saving us time, money, and (perhaps) slight embarrassment. Just place the decal over your face and dab it with a damp sponge until it's fully adhered. When you're ready to remove it (which we never will) just use rubbing alcohol and follow the included instructions. 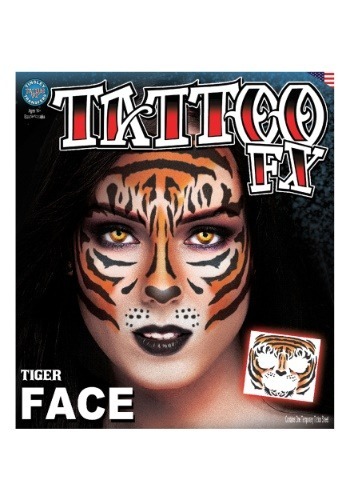 This product is perfect for those who are admittedly inept at applying makeup or for those wanting to be known as... tiger face. This unique accessory pairs well with any tiger costume chosen. Or you can be like us and wear it with your normal, everyday clothes. So far everyone thinks we're fierce.